I like non woven polypropylene for the durability, they store very easily and they are very light weight. Good value product sold at a great price. The material of these bags is so strong! They don't wear or tear even when carrying a lot! These bags are great! I can't believe they can hold up to six bottles of wine! This was used as a free item to bring advertising to my organization. It was a successful plan and I will be reusing this company custom earth promos for the future need of recycled products for advertising. These bags have such great structure and support! The bottle dividers are great as well. The bottom insert really sets this bag apart from the competition. It helps protect against breakage, an amazing asset. We are so excited about our bags! They look amazing and our clients can't stop buying them! The surface area for the logo on these bags is amazing! Impossible to miss. Couldn't be happier! Our bags looks and feel amazing. I highly recommend using this wine bag if you have multiple glass bottles to package. I used this bag as tool to market my new brand of liquor and it has been a big hit amongst the community. The edges are sewn well, you can fit six bottles of different sizes in the compartments and not worry about the bag failing on you. I suggest this six bottle sized reusable tote. Nice way to carry 6 full bottles while it advertises my company. We sell boxes of wine to liquor stores across the country as a way to cut back on wasteful cardboard we used this reusable bag as promotional item for the holidays. All of the stores loved it, our delivery men also did not mind as well because the bag is constructed well and does not break or tear. Good bargain for a high quantity order. Very happy with this reusable wine tote. We ordered the tan bag specifically because it goes well with the color of white wine. Which is what we make and sell the most of. The best reusable eco-friendly bag company I have found on the internet. There website is super informative and you get a quote instantly. Padded bottom makes a big difference for heavy bottles. I suggest using this bag for its eco-friendly properties and its functionality. The Velcro handle holder helps a lot. The print looks nice on the black bag we ordered. The customer service was good. I would reuse them for another reusable bag order or maybe some of there other items as a promotion. I love using custom earth promos for there wine totes, its always an easy process placing my order on there website. Businesses from many different industries are selecting eco-friendly options when it comes to promotional products to boost their brand. 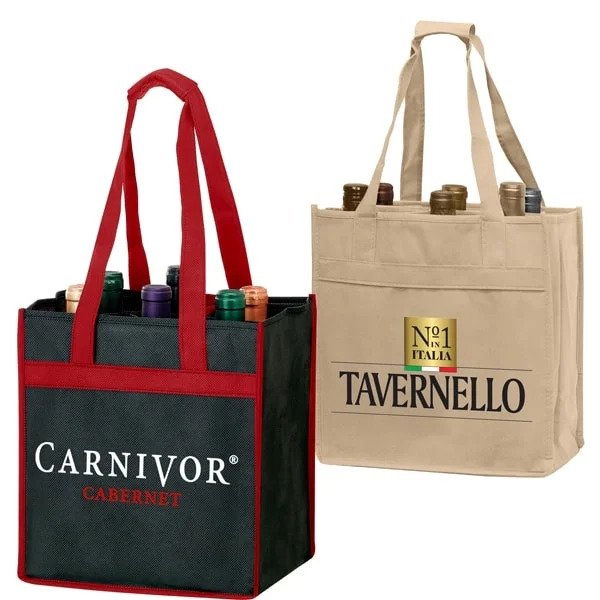 Making an eco-conscious choice like the Reusable Wholesale 6-Bottle Wine Totes from Custom Earth Promos can automatically propel your brand to top of mind with both existing and potential customers who take environmental protection very seriously. Giving you plenty of room at 10" W x 11" H x 7" D, these large bags come with a generous imprint area to help keep all eyes on your brand logo. These recyclable bags are popular with resorts, wineries, hotels, and restaurants and other hospitality businesses. But any type of organization will find these meticulously designed wine totes to be an invaluable tool for impressing potential customers from all walks. You can add custom messages, slogans or designs to your bags, to build positive awareness for an upcoming event or an exciting new product or service. Or maybe include a catchy slogan that will stick in people’s minds to bring awareness to your favorite special cause or charity. These Reusable Wholesale 6-Bottle Wine Totes help you do all that and more, in a responsible, green-friendly way that can effectively help your business grow. This reusable 6-bottle wine tote is the perfect giveaway product for promotional events, store openings, business parties or trade shows. We design these stylish bags in your choice of color: Red, Hunter Green, Burgundy, Royal Blue, Black, Navy Blue or Tan. Or you can even select multiple colors for your entire wholesale order. Our experienced team of design experts will help you come up with a tailor-made imprint that powerfully expresses your brand image and values. Designed for strength with 7-inch bottom gussets and 20-inch handles for easier carrying, these totes also feature stitched seams, a reinforced plastic board bottom insert and sewn-in bottle dividers. And contents are kept safe with Velcro closure strips that help keep the top of the bag sealed shut. This tote is made with 100 GSM post-industrial recycled content and, like all of our products at Custom Earth Promos, it complies with California's Proposition 65 standards. This means that every product leaves our facility only after it has been confirmed free of harmful contaminants such as chromium, cadmium and others. 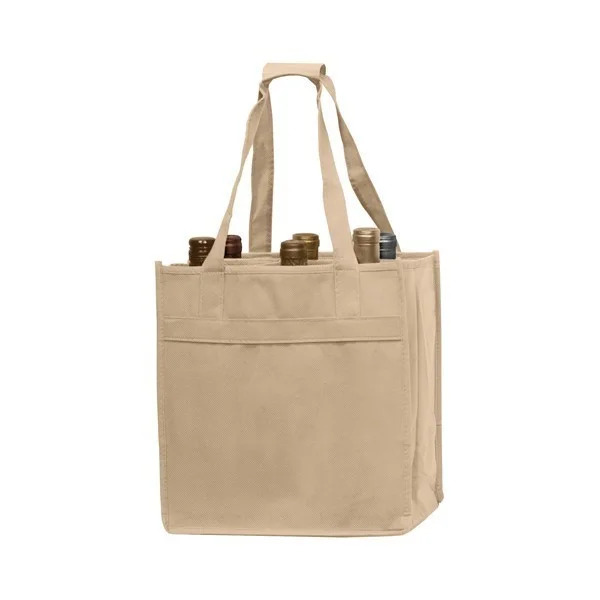 You can depend on Custom Earth Promos to build you a custom promotional wine bag that is exclusive to your brand. This personalized tote will help you stand out from your competitors. 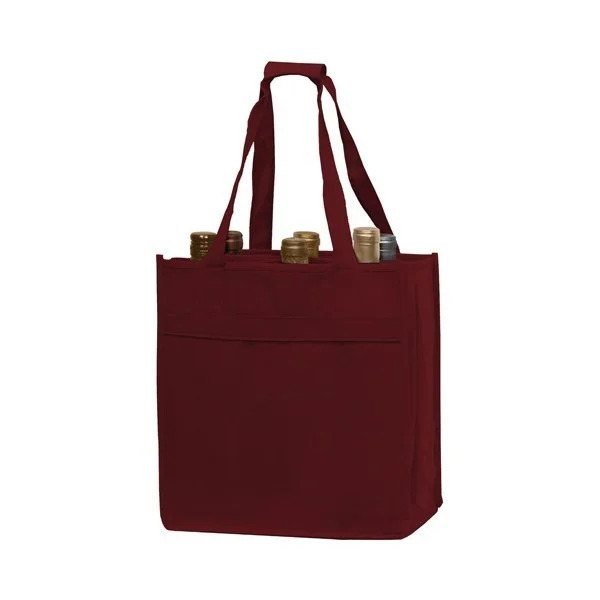 We can build your wine bags with a fabric color that matches that of your brand logo. Plus we can design handles in the color of your choice and provide edge-to-edge printing at no additional cost. Take advantage of our overseas production facility to make your order incredibly affordable, including further custom options such as additional pockets and insulation and dimension adjustments.